An attempt to brand Common Core opponents as people too ignorant to know fantasy from reality has backfired. The New Orleans-based Alliance for Better Classrooms PAC launched a marketing campaign last week with stuffed pink unicorns. 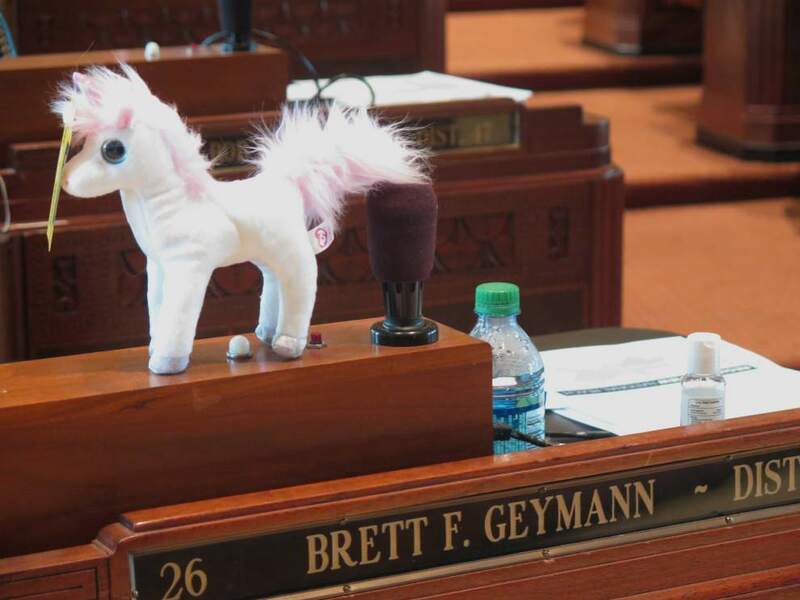 According to The Advocate, state lawmakers were in their third day of a two-month session last Wednesday when most of their desks were dotted with the stuffed toys. “We owe it to our kids to educate ourselves and realize exactly what Common Core State Standards do,” Juneau said. The unicorn marketing ploy, however, has created quite a backlash, leaving some organizations and individuals trying to distance themselves not only from the ABC PAC, but from the entire Common Core debate. When numerous Louisiana parents, educators, and other Common Core opponents took to their phones and emails to express their outrage to organizations and businesses listed as Common Core supporters at UnicornsAreNotReal.org, they found that several of them were not even aware that their names were being used. For example, a Rapides Parish educator, who wishes to remain anonymous, tells EAGnews that she received an email from Deborah Randolph, president of the Central Louisiana Chamber of Commerce, stating that the Chamber did not give permission to ABC PAC or anyone else to use its name. In fact, she said the chamber had previously rescinded its support of the Common Core national standards initiative. In another email, Chamber director Lindsey Marone also said that the Chamber takes a neutral stance on Common Core, adding that she has personally contacted the UnicornsAreNotReal website to to ask that the Chamber’s name be removed. A pro-Common Core group is using my name without permission and attributing ideas to me that are wholly untrue. I have stated many times over that I oppose Common Core and anyone who says otherwise is either misinformed or not telling the truth. I believe education is a family function, not a federal function – period. Nothing is more emblematic of Washington arrogance and reckless central planning than Common Core. The federal government has stuck its obtrusive nose into local education and hijacked the system. We must kill Common Core and restore common sense. I find it very offensive that the arrogance of the elitists has led to the mocking of parents in public. To equate a mother who is fighting for her child to a person who believes in unicorns is unacceptable and pathetic. They have crossed over the line of public debate and determined themselves to be part of the ruling class. We intend to stop them. According to The Advocate, in 2011, ABC PAC leaders vowed to spend up to $1 million to elect BESE members sympathetic to their goals of increased school choice and sweeping changes in how public schools are funded. ABC-backed candidates won in five of seven races. The news source also reports that former New York City Mayor Michael Bloomberg’s trust donated $100,000 to the group in 2011, sparking complaints by public school groups of outside interference in Louisiana contests. This entry was posted in COMMON CORE/CSCOPE - GENERAL and tagged ABC PAC, Alliance for Better Classrooms, Brett Geymann, Common Core, Louisiana, Mike Huckabee, unicorns. Bookmark the permalink.